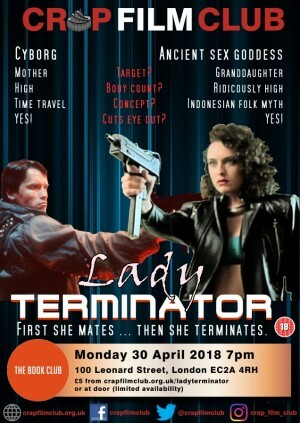 Lady Terminator (Pembalasan ratu pantai selatan) is a 1989 Indonesian fantasy horror action film considered to be a rip-off of the 1984 American film "The Terminator". Get ready for a wild ride! A sexually rapacious Asian goddess, known as the "Queen of the South Sea", possesses the body of a young female skin diver. Armed with an AK47 and an endless supply of bullets, this murderous Lady Terminator takes to the streets on a revenge filled rampage, hunted by a cop with the worst mullet this side of country music. Countless people get shot, numerous scenes get lifted from James Cameron's sci-fi opus, clothes get shed with abandon...it's all fairly strange but never not completely hilarious and entertaining. Cliff Doerksen of The Chicago Reader called the film "the kind of movie best randomly discovered on cable at 4 AM, but if you dig guys with mullets, director H. Tjut Djalil has some serious treats in store for you". Kyle Anderson of Nerdist wrote that the "movie isn’t good, but it’s totally worth watching because of how baffling it is". Remember, you can't go back in time once all the tickets are sold so don't be an April fool, join us for our first Book Club screening of 2018!